Adriaen van de Velde (1635-1672) was born in Amsterdam, where his studies were first directed by his father, and later by Wynants. This excellent artist was equally proficient in painting landscape, coast views, domestic animals, and human figures. 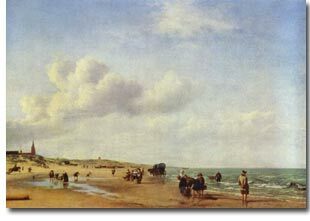 Many of his figures in landscapes by van Ruisdael, van der Heyden, Hobbema, Hackaert, and others add to their interest and value. His sense of tone and colour is to be admired, as well as his delicacy of form and outline. He shows a wonderful subtlety in the gradation of almost neutral hues. His sandy coast scenes have air, space and perspective, full of poetic feeling.